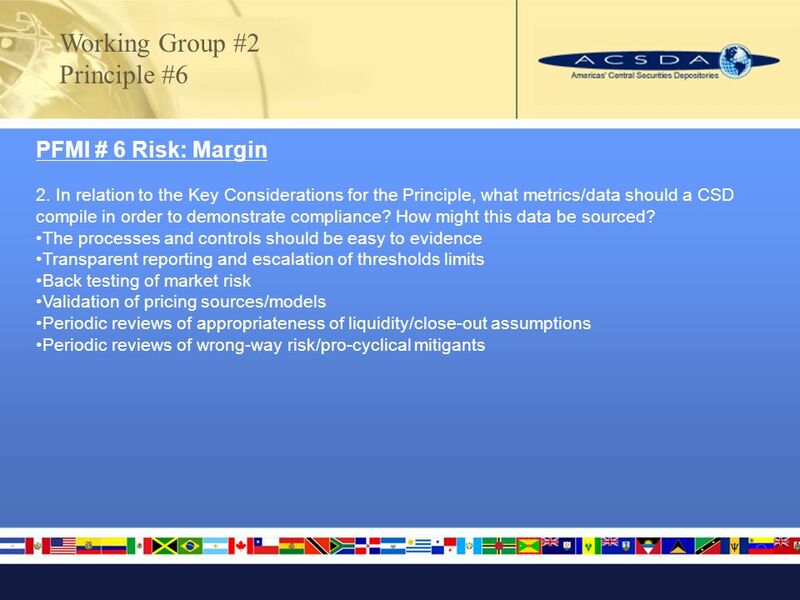 Working Group #2 - Report Credit & Liquidity Risk. 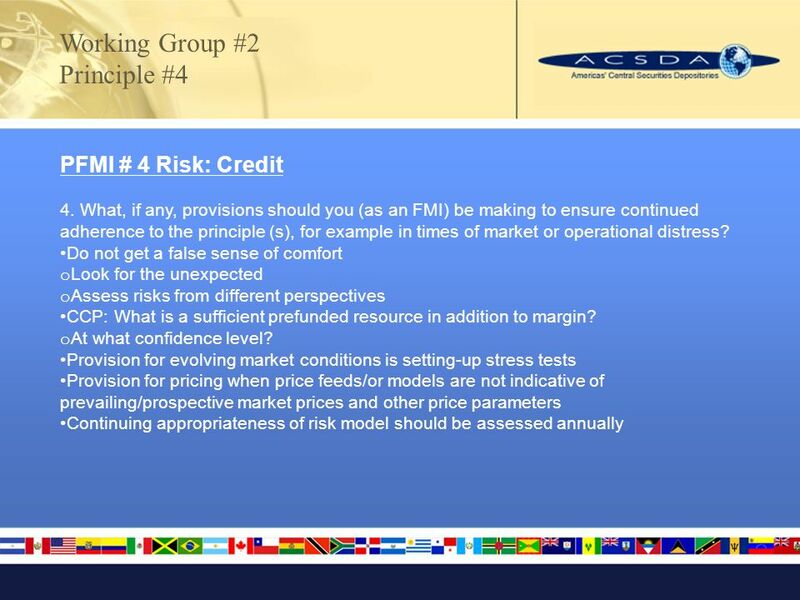 3 Working Group #2 Principle #4 PFMI #4 Risk: Credit 1. What constitutes "compliance" with the Principle? Describe (in specific terms) the state characteristics of a CSD that fully meets the requirements of the Principle. 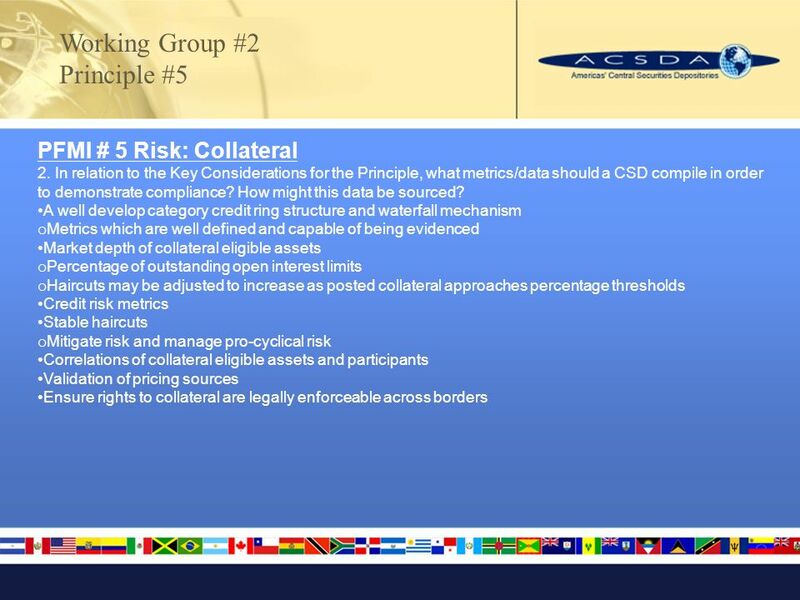 11 Working Group #2 Principle #5 PFMI #5 Risk: Collateral 1. What constitutes "compliance" with the Principle? Describe (in specific terms) the state characteristics of a CSD that fully meets the requirements of the Principle. 19 Working Group #2 Principle #6 PFMI #6 Risk: Margin 1. What constitutes "compliance" with the Principle? Describe (in specific terms) the state characteristics of a CCP that fully meets the requirements of the Principle. 27 Working Group #2 Principle #7 PFMI #7 Risk: Liquidity 1. What constitutes "compliance" with the Principle? Describe (in specific terms) the state characteristics of a SSS & CCP that fully meets the requirements of the Principle. 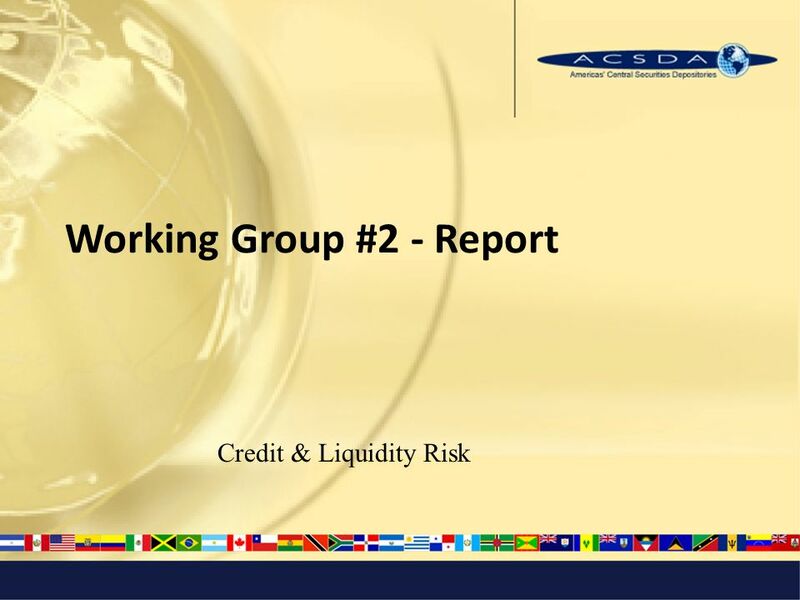 Download ppt "Working Group #2 - Report Credit & Liquidity Risk." Development of a Mongolian MBS Market Workshop on Housing Finance 28th June 2011 Presented by Jim France. Rizwan Chughtai. Risk exposure arising from business activities Need to effectively manage because of Potential business losses Ensure business continuity. 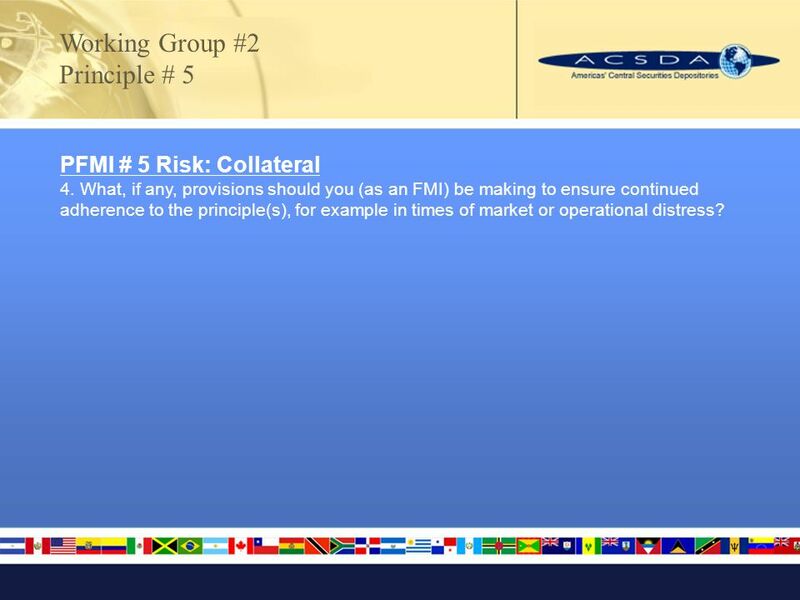 ACSDA Leadership Forum CDS Financial Risk Model Summary of Key Financial Risk Controls Nauman Mahmood, Managing Financial Risk Director October 9,2007. 1 CPSS-IOSCO Principles The self-assessment experience ACSDA Senior Summit – Dec/13 INFORMATION CLASSIFICATION (CHECK WITH AN “X”): RESTRICTEDCONFIDENTIALINTERNAL. 1 Global Real Estate Valuation Policy Update: the European Perspective The principle: the EU Treaty does not provide the European institutions with direct. 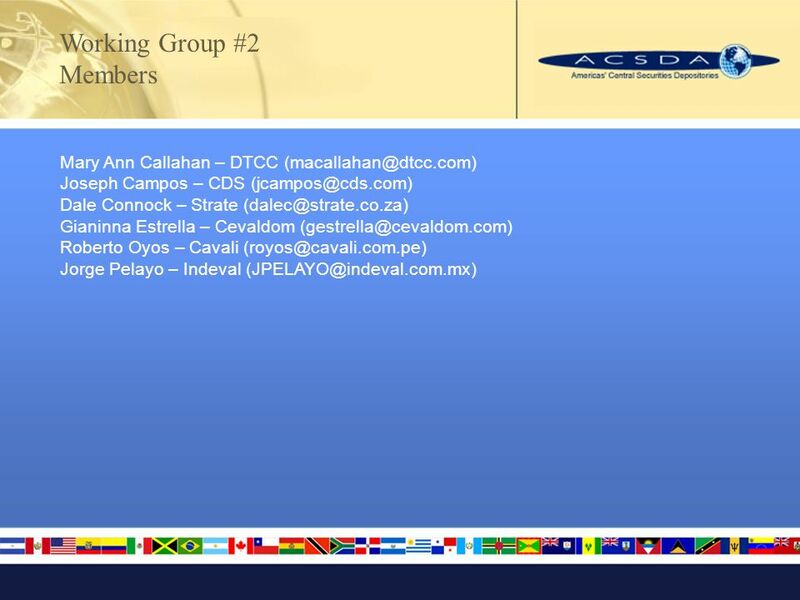 Risk Management and Internal Controls ASSAL 20 November 2014 Annick Teubner Chair, IAIS Governance Working Group. New European Regulations covering Investable Indices Two new sets of European Regulations covering Benchmarks (Indices) where there are investment products. 1 ICP 18 to 23 Presented in One day Workshop on Financial Sector Assessment Program N. Srinivasa Rao & S. P. Chakraborty Hyderabad, 29 th December, 2010. 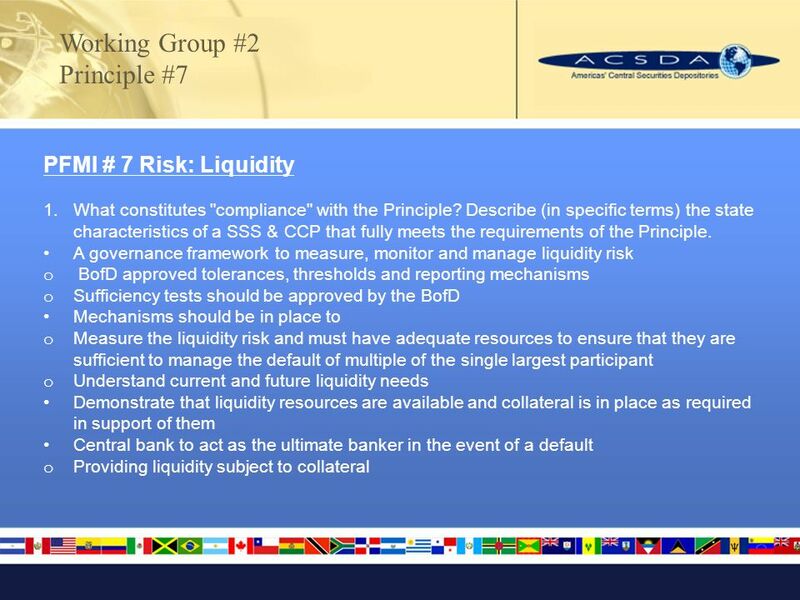 1 The critical challenge facing banks and regulators under Basel II: improving risk management through implementation of Pillar 2 Simon Topping Hong Kong. Investments Institute of Insurance and Risk Management (IIRM) Hyderabad, India 15 November 2005 Arup Chatterjee – Advisor International Association of. 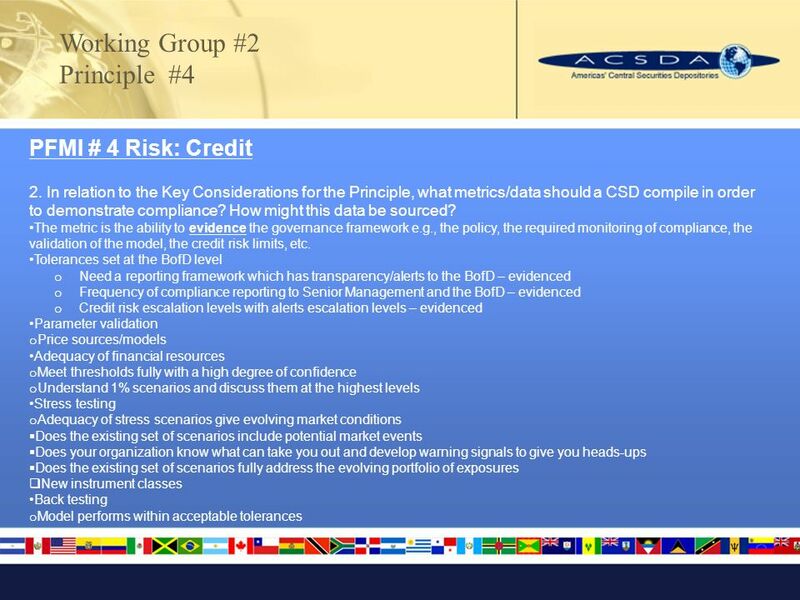 The accountant’s mission in risk control Marco Venuti 2013 Risk and Accounting. 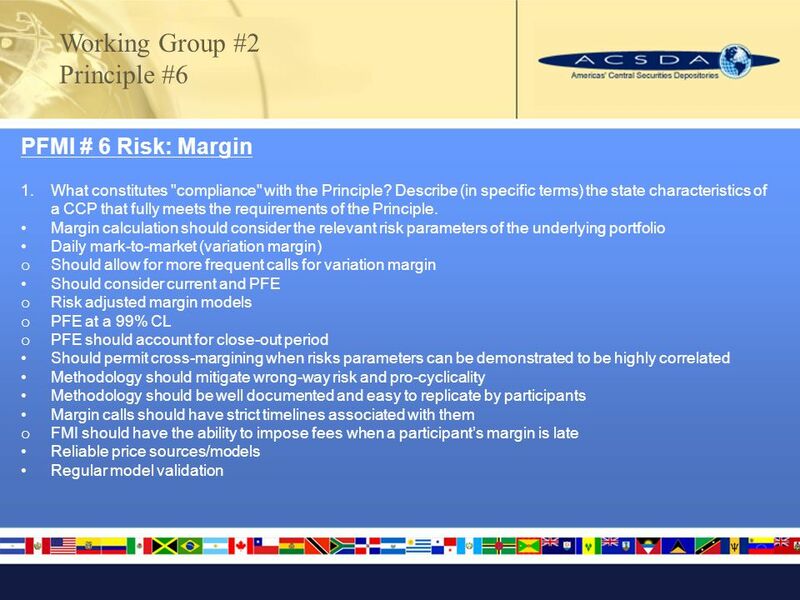 Role of actuarial function supporting the FLAOR leading to the ORSA Ian Morris June 2014. Portfolio Margining James Barry, Executive Director Collateral and Margin Services. Chapter Six: Credit Risk Management. Business Risk Operational Risk Financial Risk Technology and operations outsourcing Derivatives documentation and. 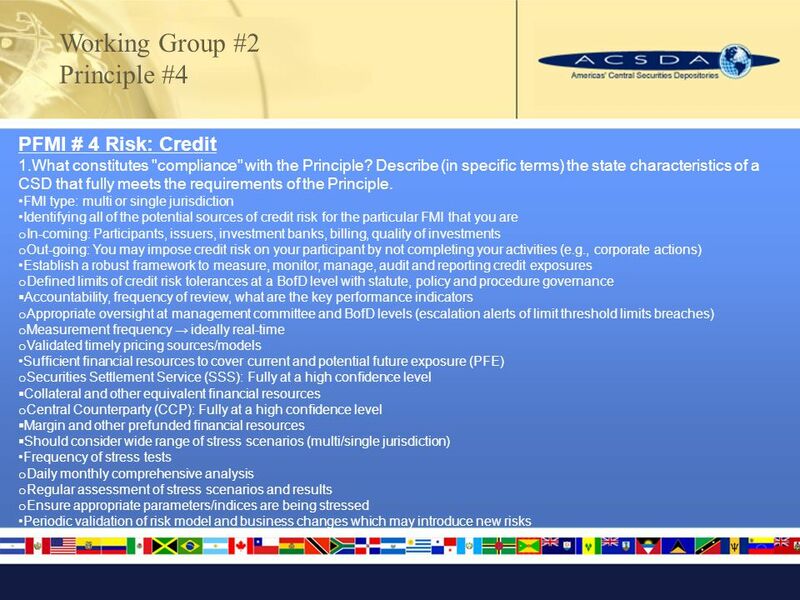 Overview of Credit Risk Management practices in banksMarketing Report 1 st Half 2009 Overview of Credit Risk Management practices – The banking perspective.